Sc. 26 completed! Some DVD mini-reviews. My next short cartoon; “There Must Be Some Other Cat” has completed principal animation. Sc. 26, the last scene was finished this week. The cat gets his comeuppance, is kicked out of his girlfriend Pearly’s house and lands in the arms of a prickly pear cactus. I had to animate the cat’s scramble after his landing in the cactus’s “arms” a couple of times to get the reaction just right and to get the musical ideas to work. Now the scenes will go to New York to be inked and painted by Greg Ford Co., Inc. With any luck, we might be in some festivals next year. I’ve posted another episode of the mysterious “Lane Allen’s Diary” from a religious weekly of the late 1950s. 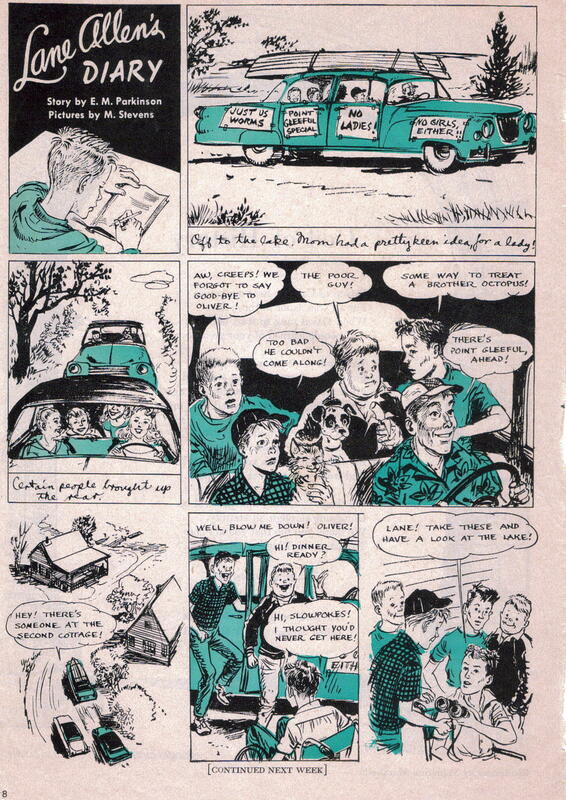 I love the drawing and the “Our Gang” feeling of this little-known strip. There are also a batch of six new Krazy strips from 10-31-1938 to 11-5. A new continuity story starts with Ignatz receiving a mysterious bon mot, only to have it intercepted by Don Kiyoti. Maybe it will continue next week, we’ll see. 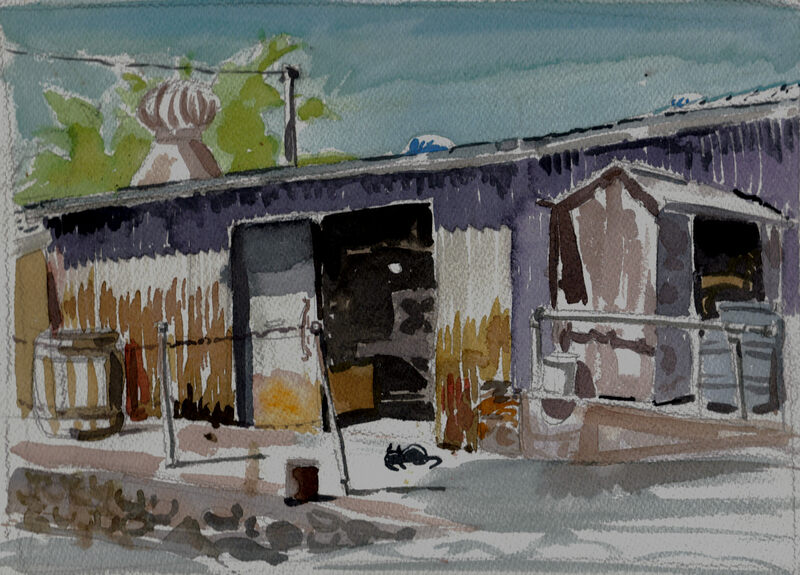 The watercolor this week is of the Catalina Island Casino, with the bay and a big passenger ship in the distance. What fun we had spending a few days painting on the island! 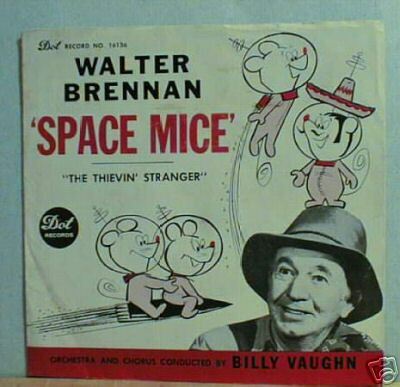 I posted the old record cover with Walter Brennan as Grandpa McCoy, to illustrate a DVD mini-review. The Infinity Co. has put out the “Complete” first season of “The Real McCoys”, one of my favorite TV series from 1957-58. Grandpa McCoy is a character who never leaves me, so strong he is like an imaginary companion. I love his crankiness, and also his compassion and kindness. A poignant part of almost every show was Grandpa’s little interludes of prayer, usually just between him and his maker, except when he says grace at dinner. This series shows a San Fernando Valley gone forever, a rural farming country, before the freeways, when transplanted farmers from West Virginia made a living from the California soil. Some of the episodes were filmed in now long-gone L.A. landmarks, such as the Ambassador Hotel, formerly on Wilshire. Grandpa, Kate and his grandson, Luke, frequently dispense corporal punishment to the kids of the family: Hassie and Little Luke. Spankings were common in the late 1950s, most kids survived the experience. Infinity did release “The Real McCoys” on DVD, but alas, it is NOT complete. These are the syndicated cut episodes, not the original ABC network versions. They run only 21 minutes and change apiece, except the pilot, which comes in at about 25 minutes. These shows when originally aired only had about two minutes of commercials, so originally ran about 28 minutes with titles. So that means almost 7 minutes of every show is gone. In many of the episodes there are very awkward scene cuts, artificial fade-outs and clipped speeches. Grandpa, as I said previously, took a moment in almost every episode for prayer, almost all those moments have been thrown out. It makes you wonder, just what is the extent of preservation on “The Real McCoys”? I have a network print of “Grandpa’s Date”, and it has his prayers and asides to the audience. Sometimes Walter Brennan did as many soliloquies in an episode as George Burns did in “The George Burns and Gracie Allen Show”. Without these scenes, Grandpa loses a lot of his humanity and appeal, and only the broad outlines of his character are left. I don’t know if it would do any good to write to the Infinity Co. or SFM Entertainment, but if this set is trying to appeal to collectors or fans of the original series, they missed the mark like a nearsighted hen! If you want to see a really good collector’s DVD, get the new Fox release of the Jack Benny 1941 version of “Charlie’s Aunt”. It’s a beautiful DVD of the only one of Jack’s movies I had never seen before, and it’s well worth seeking out. It was one of Jack’s personal favorite performances. It’s played pretty broad, and has a lot more slapstick and a faster pace than the Charlie Ruggles 1930s version. Randy Skredtvedt, the musicologist and Hal Roach expert, does an astounding and extremely informative commentary. He barely takes a breath for 82 minutes as he rattles off dozens of entertaining facts about Jack Benny, Richard Haydn, Edmund Gwenn, Kay Francis and even the set decorator! What may have kept this film off TV and home video for so long is that the original play is still under copyright, and the copyright owners only leased the rights to the play for five years at a time, then recalled the rights. It makes me wonder why the Ruggles version has been so ubiquitous all this time, if the rights story is true. Anyway, get this film and enjoy Jack Benny in drag having a wonderful time, especially when Anne Baxter and Arleen Whelan are giving him passionate kisses! Here are the KKs from 10-24 to10-29-1938. I love the tripling of the cast with beards and striped outfits. The conical hats and sunglasses make Offissa Pupp look like Rabbis! It’s amusing that Pupp, Kat and Mouse can’t tell each other apart from their doubles, or is that triples? Anyway, it’s a graphically arresting sequence. 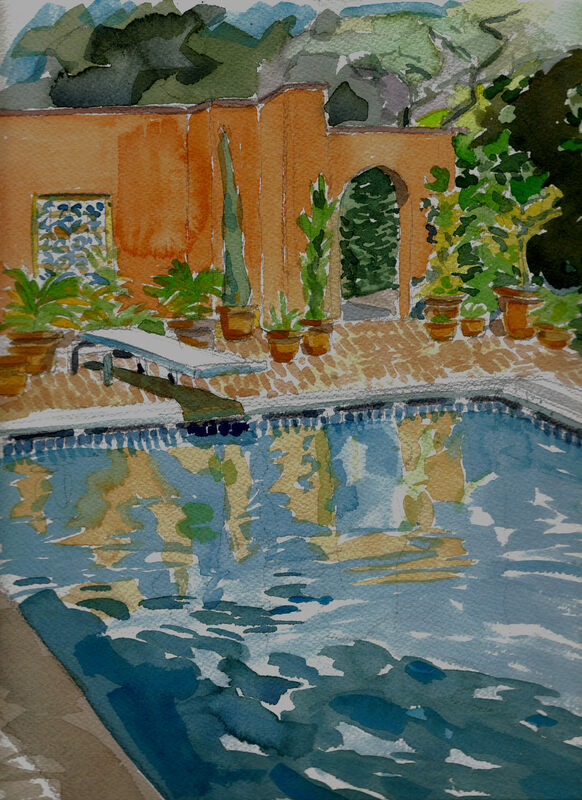 Cathy and I did not go painting last week, too darn hot, as Ann Miller once sang. 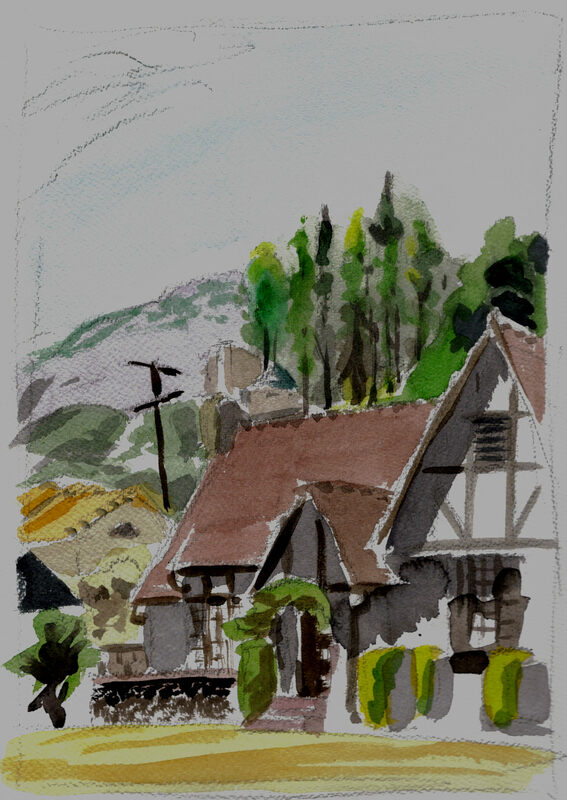 I posted a watercolor I did of a little house in Monrovia that was painted on a hot and sunny afternoon a few months ago. Cathy likes the placement of the telephone pole in the composition. There were some beautiful old houses in that neighborhood, including one that had been transplanted from another part of town. In film collecting, I came across a print of the 1940 black and white version of Paul Terry’s “The Snow Man”, remade in color in 1946. I have been searching for a copy of that cartoon for over 35 years! I was very curious about the re-make, wondering whether they just re-did the cels and backgrounds in color, or made changes. My friend Veto Stasiunaitis posted it for auction and I took a chance on it, thinking it just might be the original version, instead of a black and white print of the color remake. I got the print from Veto, and put it on the projector without inspecting it first, that’s how excited I was to see it! The title card came on, and gave a 1946 date, so I was disappointed. But, as I watched the cartoon, the staging and animation of the three little rabbits building the snow man looked different, and when the snow man sings his song, he imitates Pinocchio by stretching his nose out! I also noticed that the bear with the Greek accent goes after the rabbits with a big saucepan, I didn’t remember that either. I got my print of the color version and ran it to compare. There are a few scenes that are the same, but the final sequence is entirely different. Instead of the bear chasing the little rabbits with a saucepan, he grabs his hunting cap and goes after the rabbits with a shot gun! The snow man takes a more active part than in the 1940 original by chasing down the bear and beating him up, Mighty Mouse style. In general, the 1946 remake shows the new more agressive tone in cartoon gags due to World War 2 and more pugnacious heroes such as Mighty Mouse. From the Nursery to the Boxing Ring in six short years. Terry remade several other black and white cartoons in color, such as The Watch Dog, Good Old Irish Tunes, The Baby Seal, The Magic Shell and Funny Bunny Business. I have the black and white version of The Watch Dog, but I haven’t found the rest of them. Hope is rekindled by the discovery of The Snow Man. The search continues. Here are eight, count ’em, eight KKs. 10-14-1938 and 10-15, then 10-17 thru 10-22. I am tired of splitting up the story lines on these dailies, so I’m going to try to post them a week at a time, just as they were originally published. We have the end of Ignatz’s trickery from last week, and a new (komplete) story in which the feminine side of Krazy is featured. She finds a butterfly’s cocoon on her front step and has a few anxious moments taking care of it. Garge really gave a gentle side to his Kat in these strips, he is fully involved in the lives of every Coconino citizen and especially wants to shelter and protect the Kounty’s little ones. During 1936’s “Tiga Tea” storyline, Krazy falls in love with little “Kitten Ket” and wants to help him and his father, another instance of the mothering side of his character. I have figured out some sort of scanning of a few of my watercolors I have talked about in past posts. Above is the swimming pool from the mansion on the Arroyo in Pasadena, and the old canning factory at the E. Waldo Ward ranch in Sierra Madre, Ca. I thought the swimming pool would be an especially appropriate subject for these “dog days” we are going through now. You may jump in, vicariously. Last week, Cathy and I painted out in Descanso Gardens in La Canada. We arrived a bit late, Cathy painted some close-ups of Koi in a pond with a beautiful waterfall. I tried to paint an ambitious study of the whole pond with the waterfall in the background, but made it too monochomatic and the composition wasn’t focused right, so I’m not posting that one. Descanso Gardens was very therapeutic for Ken Anderson, by the way. If you look at the Disney Family Album episode he is featured in, he talks about how after his stroke, his wife took him to the Live Oak Grove in the Gardens. She placed him on a bench, folded up like a suitcase. As Ken recalled it, looking at the spreading branches of the oak trees made him want to spread his own arms and legs and get up and walk again. That’s a beautiful story and a great visual image to think about, even if it didn’t quite happen that way. My natal anniversary was last week, Cathy and I celebrated it with our dear friends, Vincent and Hiroko Davis out in Shadow Hills at a little Chinese restaurant there. They served a Chinese birthday cake called the “Chinese Well”, which had a well of chololate cake, surrounded by ice cream and frosting. The whole meal was very good, I just had some of the leftovers tonight, and they were still tasty. It’s wonderful to be remembered by good friends like Vince and Hiroko, love you! I am still enjoying the Woody Woodpecker DVD set, haven’t found one cut scene yet, except for the print of Banquet Busters not having the UA titles. I haven’t been able to see any DVNR in it either, and I have been looking at a lot of the shots one frame at a time. The 1940s Lantz animators were very innovative with their comic, stylized animation. If you look at it a frame at a time, you appreciate their achievements all the more. I laughed at La Verne Harding’s animation in “Fish Fry”. Her best scene in that picture is the last one of the cat beating himself up for joy. The scene’s concept couldn’t have been easy to put over, but she made it look easy, supported by the great voice of the cat screaming “I made it, I MADE it, I MADE IT!! !” The cat’s Paul Terry-ish run to the horizon is funny and quite convincing; it’s a great example of the “successive breaking of joints” Art Babbitt principle. His feet contact the ground, his knees break on the next frame, then his hips “break” after that, following thru very loosely. The bulldog just sitting there through the whole performance is very wry and makes the cat’s demented ravings seem even more demented. Have fun watching these folks, they are worth looking at! Howdy folks, here’s the 10-7-1938 to 10-13 Kats. This week we have the finish of the Kolin Kelly phone-in story line and the beginning of a somnambulistic story. Ignatz and Offissa Pupp are so ingrained in their respective mod-ii that they can do it in their sleep! I like the “speed lines” in 10-13 as Ignatz does an animation style zip-out in the last panel. It’s been a good week, Cathy and I got over to the Pasadena City Hall on Thurs. morning to paint the tower and stately dome of the City Hall with our group. Cathy painted a beautiful oil with a limited palette of yellow ochres for the City Hall dome and violets and greens for the foliage in front of it. I did a watercolor basically imitating Cathy’s colors. She suggested that I make the shapes of the clumps of tree leaves in the foreground darker and to connect the shapes. I think I did one of my more successful trees because she cared enough to give me some advice. Painting trees is a balancing act between trying to draw the branches and leaves realistically, and abstracting the tree at the same time so that it looks like light is filtering through the leaves and there is good contrast between light and dark shapes. If you are near Pasadena, California through August 11-26th, come to the Pasadena Museum of History on 470 Walnut St. There you will see a beautiful new show of paintings called “Contemporary Masters”, consisting of local scenes of Pasadena in all media. Look for an oil called: “South Pasadena Farmers’ Market”, it is by my favorite Contemporary Master: Cathy Hill! We go to that Farmers’ Market almost every week, and Cathy was inspired to do a study of the produce stands and the customers. It’s a great honor to be in this show, you will see a lot of good work in it. Please come if you are able! I am now on the last third of the first run-though of Sc. 26 on my new Cat cartoon. In this part of the scene, the cat flies through the air and lands on a cactus which “kisses” him. It’s another “high-mileage” shot, but I will keep at it. I broke down and bought the new Woody Woodpecker DVD set. I am a lifelong Walter Lantz fan, I started with his 1930s Oswalds on TV and then got hooked on the Woody Woodpecker show sponsored by Kellogg’s in the mid 1950s. Despite a lot of censorship and editing of the old cartoons, Woody’s spirit came through and has endeared him to me forever. This new collection has all the Woodys from 1941 to 1953(?) in order and almost fully restored (Banquet Busters does not have the original UA titles, for instance). All the cut scenes have been put back, such as the alphabet soup gag in The Reckless Driver and all the ration book dialog from Ration Bored. The revelation for me was to see most of the 1948-49 releases with the original United Artists credits restored! The cartoons start out with no logo, but go immediately to the tree trunk that Woody bursts out of and that great “over the seats” truck in to a painting of Andy Panda on stage. Can you imagine how good these must have looked in the theaters with the curtains timed just right to finish opening as the main titles came on? Scrappy Birthday has a title card that I’ve never seen before! I helped Jerry Beck pick some of the cartoons for the set, such as the Oswald titles “Hell’s Heels” and “Spooks”. “Hell’s Heels” is a take-off on “The Three Godfathers”, I love that loose walk that Bill Nolan animated as the baby boy drags Oswald along by the hand through the desert. Bill Nolan also animated the “I am the Queen of the May” song that Kitty sings in “Spooks” with the record player strapped to her back. Lantz’s studio was a haven for the highly individual approach to animating characters practiced by Alex Lovy, Emery Hawkins, Bill Nolan, Ed Love, Fred Moore, Don Patterson and Les Klein among many others. In The Merry Old Soul (1933), La Verne Harding put her comic strip charater, Cynical Susie into a scene as an incidental courtier, I never noticed that before until I got this set. The Walter Lantz animation “talks” from the Woody Woodpecker show are here, six of them, and all interesting. The prints on these are a bit faded and beat-up, but where else do you get to see Alex Lovy, Paul Smith and Homer Brightman jamming on story sessions with a trombone? At the second Annie Awards banquet, they gave one Annie only, this time to Walter Lantz. I was the projectionist at that affair, and I put together a special reel using some cartoons borrowed from the Lantz collection. I had to bring them back to the studio the next day, and I really was looking forward to getting to speak with Lantz one-on-one. I waited in the lobby with fannish trepidation! Walter came through a wooden door on the far side of the room, in my mind’s eye it was almost like Woody himself had popped through that wooden door! I tried to say something, I think it came out like “I’ve always loved your cartoons…” or words to that effect. Lantz just took the 16mm prints from my hands, looked me in the eye and said: “Just let the old man get back to his spaghetti, will ya?” He turned on his heel, walked back through the door and slammed it shut! Evidently, he was having lunch. End of meeting. You are currently browsing the Mark Kausler's CatBlog blog archives for August, 2007.